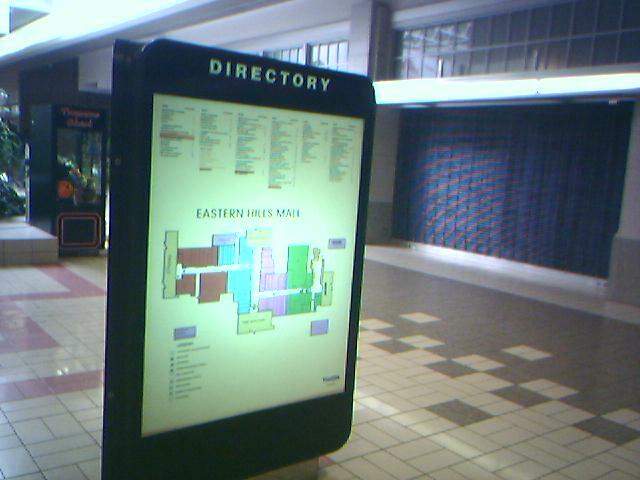 In most major metropolitan areas, the Eastern Hills Mall would be a success. But not in Buffalo! Poor Buffalo, really. It’s bitterly cold out there, they’re responsible for the Goo Goo Dolls (as opposed to, say, The Replacements), and like most Great Lakes cities, the major industries have shifted elsewhere laying the groundwork for the region that’s sadly and derisively referred to as the “rust belt.” I’ve long felt a bit of affection toward poor old cities like Buff-town, probably because I grew up in Rhode Island, and Providence was mired in a similar state of malaise at that time. Nowadays Providence is beautiful, and Buffalo has a lot of its own wonderful natural attributes–Niagara Falls, that gorgeous yet faded downtown retail district–that may work in its favor someday. If there’s any justice anyway. The good news is that–although I haven’t been back in awhile–the Eastern Hills Mall seems to have rejuvenated itself a bit. 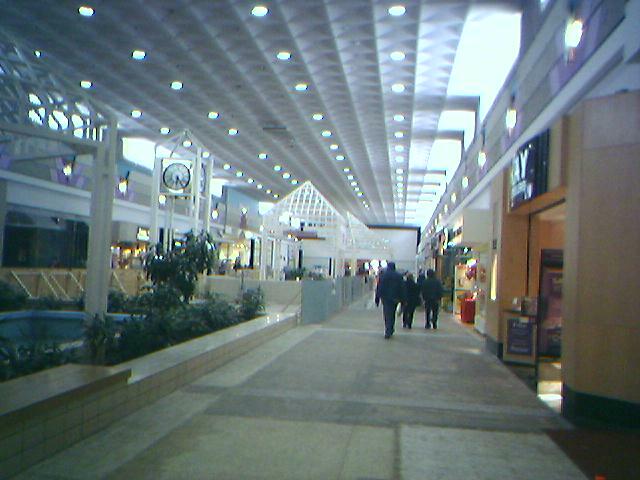 Built in 1971 as the fourth and largest mall in the greater Buffalo area (until the massive Walden Galleria opened, anyway), this mall, tucked deep in the northeastern suburbs of the Buffalo area, was suffering something fierce in the early ’00s. Anchored by JCPenney, Kaufmann’s, Sears, and The Bon Ton, the mall nonetheless hosted some large vacancies, notably a dead Jenns store (which had, for some time, been a Burlington Coat Factory), a former Waccamaw, and a former Old Navy. As of when these photos were taken in February 2005, the Jenns and Old Navy spaces were vacant, and the Waccamaw space was occupied by an RV Dealership. Mercifully, Eastern Hills Mall had one major factor in its favor: it’s rather hefty size. Despite being just under a million square feet–which is large, but not huge–it feels like a goliath, especially with its six anchor slots. Because trends have shifted in favor of large malls, they’re somewhat insulated from the challenges facing many malls, and Eastern Hills had a better shot of survival than some other enclosed centers in a similar situation. 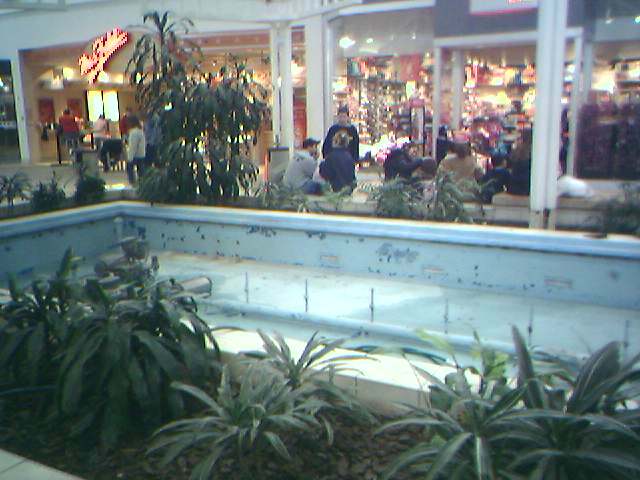 Thanks to an early 2005 renovation, which was underway when these pictures were taken, the mall seems to have entered something of a mini renaissance. 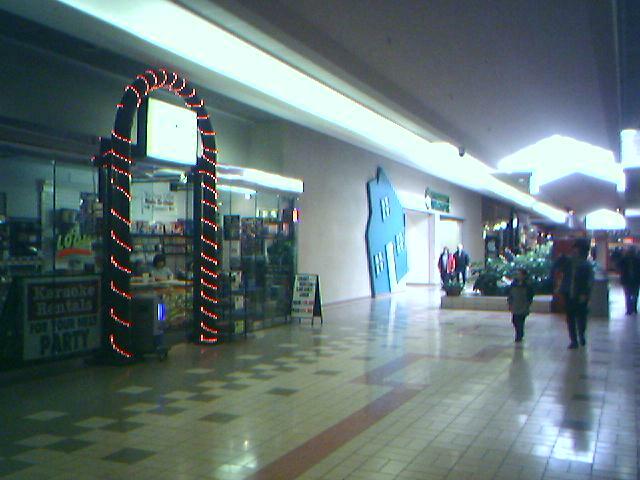 The addition of destination tenants like Dave & Buster’s and Orvis have probably helped re-establish Eastern Hills as one of Buffalo’s most important malls, after Walden Galleria and Boulevard Mall. Also, although I haven’t visited since the renovation was complete, it’s easy to notice that the waffle-style ceilings in the center corridor appear to remain intact, even after the spiffication. The rather grand center corridor was the mall’s architectural highlight; distinctly a relic from the 1970s, it’s appropriately dramatic the way the center of a good shopping mall should be. Eastern Hills is slowly coming back. 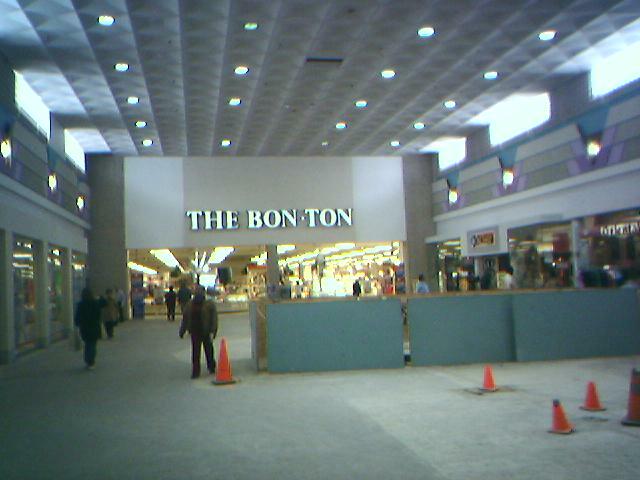 From a historical standpoint- the Bon-Ton was previously AM&A’s- a locally owned department store until the Bon-Ton bought them out in 1994(ish). Kaufmann’s is now Macy’s- it was originally Hengerer’s (locally owned), merged with Sibley’s of Rochester, then took the name of Pittsburgh’s Kaufmann’s (May did not rename the Kaufmann stores when they merged the division with Filene’s). The mall is still alive, and that stretch of Transit road is getting heavy traffic as Amherst and Williamsville get the brunt of the urban spraw since the majority of this area’s population has moved into surrounding suburbs. Last I recall the city itself had a population of 500,000 but several million occupied the suburbs. The former Hills then Ames strip plaza, which also had the original Burlington coat factory adjacent to the site was razed and now has a Barnes & Noble, Best Buy, Bed Bath and Beyond, and several restaurants. The old Silo is an Office Depot. The mall itself is fairly well occupied, aside from a lackluster food court (given the large number of close by restaurants not much of a surprise). Given its relatively high occupancy at present it isn’t really dead or in threat of being so, but it feels outdated. The Boulevard Mall in contrast feels classy and new despite being old. Whether this can be penned down to cheaper renovations, or the wrong store mix I can’t say. Still this is a busy area so I wouldn’t think this mall would be closing anytime soon if at all. The area doesn’t seem to have much difficulty supporting this, the Galleria, the Boulevard, and the McKinley malls as well as the Southgate Plaza, the occupancy rate is usually fairly decent. 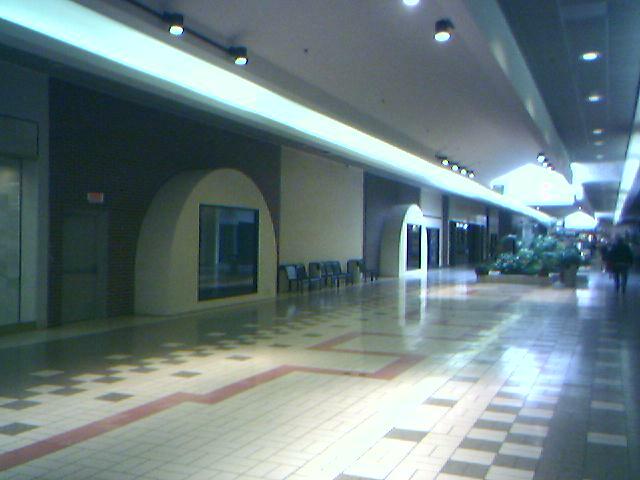 At any given time it seems the Galleria has the most vacant tenants. The former Woolthworths/ Waccamaw store is now a sports performance park. Duff’s recently open a new location in the former Brick Oven Bistro restaurant which was vacant for awhile. Duff’s Famous Wings has recently opened. Mall is clean, safe & friendly. Great parking. They have JCP, Bon-Ton, Sears & Macy’s. American Eagle, Aero, Vic Secret, Gap, Mac Solutions Plus, Laux, Express & more. @Toadbeast, I could take a wild guess(es) on what’s going to go in Dave and Busters’ place, a haunted house during Halloween season or a car dealership since the mall has a lot of parking spaces that go unused. But I have to agree with you on the food court thing. Recently, Macy’s announced it would be closing it’s store at Eastern Hills and in Hamburg, N.Y. due to slow sales. This a huge blow for both malls as Macy’s has been a charter tenant at both of these malls for awhile. Eastern Hills has already lost Dave and Buster’s and Macy’s was a key tenant to try and help an already struggling mall. It will be extremely hard for both malls to fill the empty spaces. •Enfield Square main store, Enfield, Conn.
•Enfield Square furniture/home/men’s store, Enfield, Conn.
•North DeKalb Mall, Decatur, Ga.
•The Shoppes at Stadium, Columbia, Mo. •Middlesex Mall, South Plainfield, N.J.
•Hudson Valley Mall, Kingston, N.Y.
•Eastern Hills Mall, Williamsville, N.Y.
•Cary Towne Center, Cary, N.C.
•Pony Village Mall, North Bend, Ore.
•Roseburg Valley Mall, Roseburg, Ore.
•Century III Mall, West Mifflin, Penn. •Virginia Center Commons, Glen Allen, Va.
•Peninsula Town Center, Hampton, Va.
•Military Circle Mall, Norfolk, Va.
•Regency Square main store, Richmond, Va.
•Regency Square furniture/home/men’s store, Richmond, Va.
A few surprises amung the closures, Irvine spectrum & Century City in the L. A. area along with the number of stores in the Hampton Roads/ Richmond areas.